Rajasthani Folk dances - Complete List: Folk dances in Rajasthan are simple dances, and are performed to express joy. 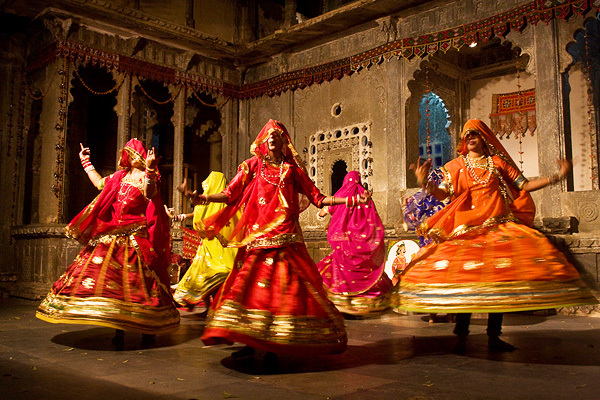 Folk dances of Rajasthan derived from various folk art cultures. Folk dances are performed for every possible occasion, to celebrate the arrival of seasons, birth of a child, a wedding, Festivals, Fairs and other auspicious occasions. The dances are extremely simple with minimum of steps or movement. Apart from the simple expressions and daring movements that add beauty to the dances, there are the vibrant and colorful costumes adorned by the dancers. The folk dances, found in limitless variations in Rajasthan, punctuate Rajasthan`s barrenness, turning the land into a fertile basin of colour and creativity and are an expression of human emotion as much as the folk music. Each region in Rajasthan has its own dance varieties and these dances stick strictly to their traditional flavors. Here is Complete List of Main Folk Dances of Rajasthan. Download Rajasthan Folk Dances Document in PDF.